An upcoming book talk at John Jay. Following thousands of Dominican deportees over a seven-year period, David C. Brotherton and Luis Barrios capture the experience of emigration, imprisonment, banishment, and repatriation on this vulnerable population. "David C. Brotherton and Luis Barrios' Banished to the Homeland promises to be a new classic in the field of ethnographic studies of marginality. 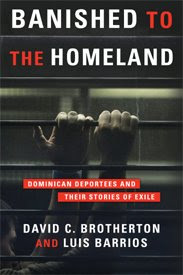 By focusing on the tragedy of Dominicans criminalized and banished to an often half-forgotten "home country", Brotherton and Barrios have pointed the spotlight on a range of events that are becoming increasingly more common within a globalized world. Whereas in the Americas, Europe or Asia, "the law" of the colonizers acts like a sort of Moloch continuously feeding itself on and at the same time expelling the "human waste" of the internal colonization processes. A veritable sociological tour de force but also a crucially topical political exposé!" — Dario Melossi, Professor of Criminology, University of Bologna, Italy.